Occasional bursts of bright sunshine this near-noon Friday on California’s north coast, otherwise rain and dark, rolling clouds seemingly without end. Except maybe for a short space starting this afternoon — according to the NWS, a break from the wet weather tomorrow, but it’ll be ‘shortlived‘ with rain forecast again for Sunday. do remember I studied science and not humanities. with words so rare they leap from my throat. A weak ridge aloft will keep conditions dry and a break in the clouds will bring some sun. Rain has been the word this season, starting last October when we received 419-percent of normal rainfall — and the sky has done nothing since but open up with record-rainfall totals. The big point is it won’t stop. so take this rare opportunity to go out and play. with an incoming front bringing rain overnight tonight and into Mon. will allow showers to continue compounding this affront. Once the trough passes by Monday night yet another ridge will be overhead. for they still can`t escape beyond the 50s. even though models still tend to disagree. because no matter who`s right it`s just going to rain some more. so you`d best be accustomed to shoes that squeak. as I looked upon them like The Raven from days of yore. 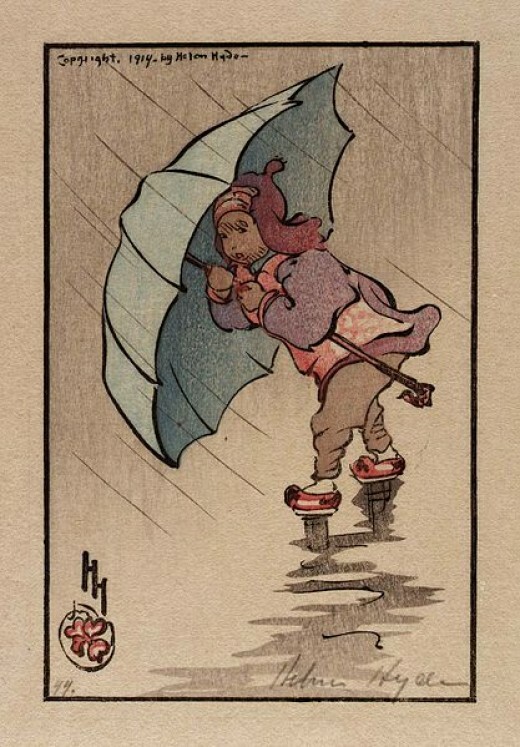 (Illustration above: ‘The Blue Umbrella 1914,’ by Helen Hyde, found here).